We use our email accounts for all official and professional communications. Therefore, it is important for us to not miss any communications which are critically important. But at the same time if you will get notification for all the emails then certainly you will ignore them. Do you know email app on your iPhone allows you to get notifications and banners form the senders you want. That means now you will not miss any email from someone who matters. 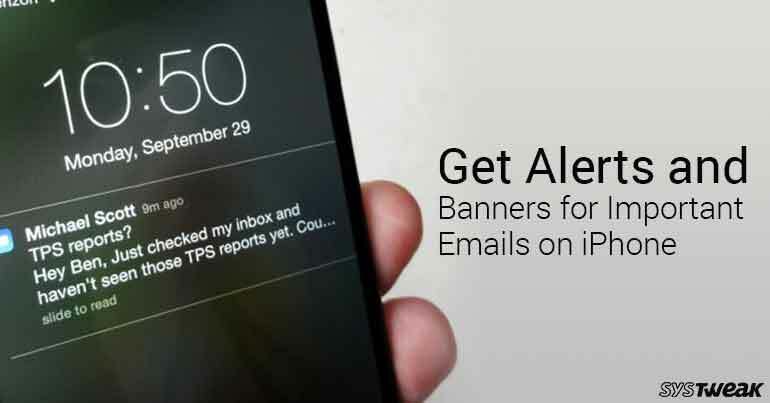 Let us find out how to get Alerts and banners for emails from specific senders. Go to email app from the home screen of your iPhone. You will see your inbox. You will see VIP list and a button Add VIP tap on it. You will be redirected to your contacts from your contact list you can add any contact with an email address to this list. After adding an address to your VIP list you will see a button of VIP Alerts tap on it you will notifications and banner settings for VIP emails. By default you will see temporary banners but it is recommended to set persistent alerts for critically important emails. After configuring these settings you will get alerts and notifications for your important emails. This is how now you will never miss your important emails. Next time, if you want to exclude someone from VIP list or if you want to add more contacts to VIP List then here is how you can do this. This is how now you will never miss your important emails and this solves the real purpose of configuring your email on your iPhone. You can also quickly Archive or Flag any email by dragging its banner.